Disgusting. These two were even more complimentary and friendly than the last two! I wanted Stone Cold Steve Austin vs. Vince McMahon, but alas, we can't always get what we want. Unlike the previous battle, we got to see two different patties this time around. For McMillen's "Maw and Paw Burger," he had Chris Bolyard grind braunschweiger into the meat, then topped it with a pickled mustard seed and onion slaw, white cheddar, and a pretzel aioli (we'll come back to this). Poletti, a man who embraces fatty foods like few chefs I know, had his "Mississippi Burger" ground with bone marrow, which was finished off with sweet churned pickles, white BBQ sauce, onion rings, and American cheese. Preparation (click the photos to open a gallery and see them larger): pickle slicing, patty making, butter melting, Busch drinkin'. And the winner's prize: The Golden Pig Skull! Once the final preparations were complete, everyone moved outside and began setting up the burger and fry cooking stations. Bolyard himself took the reigns of the thick cut French fries, frying them in the sweet, sweet beef tallow that all battle attendees have come to know and love. Even if you're not a burger eater, coming to one of these battles and just drinking beer and eating Bolyard's fries would be a delicious experience. Bolyard took it upon himself to once again light the enormous grill, and within minutes, it was as hot as the sun. I was sweating because of it and I wasn't even close to it! The rest of the Bolyard's team finished up the final touches, like setting up the check-in table and grilling the buns, and then the madness began. Once the horde of people arrived, it was go time. 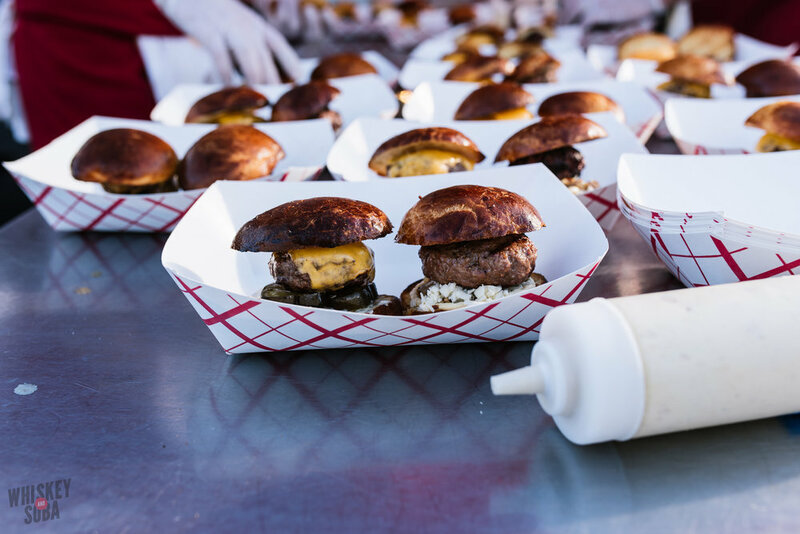 Like a well-oiled machine, burgers were quickly handed off from chef to the team plating up each burgers on the beautiful Refection buns. After the burgers were completed, Bolyard came through with fistfuls of searing hot fries. What a badass. Both burgers were excellent, in my opinion—though I won't tell which one I voted for. McMillen's patty was my favorite of the two, thanks to the braunschweiger giving it a slightly livery taste. I know that probably doesn't sound very appealing, but I think it makes for a unique burger eating experience, especially when paired with the pickled mustard seeds and onions. And let's not forget about the pretzel aioli. My god, that was a tasty sauce. I told him that it needs to be used at Sidney Street ASAP. I could dip fries in that all day. I was worried that his heavily German influenced burger would be too fancy for the battle, but it was a huge hit. Unfortunately for McMillen, it wasn't as big of a hit as Poletti's—though the votes were close. His take on a more classic cheeseburger won the people over. Before the battle even began, I was snacking on those sweet, thick cut pickles with the white BBQ sauce (you may recall that I fell in love with it a year ago) in the back of the Bolyard's shop—once they were both on the burger, along with gooey American cheese and crunchy onion rings, it was pretty much game over. Gluttony and excess won out. I can't wait for next spring's battles (but my body can).